I can't wait to share some photos of our fun weekend in Santa Barbara with Marshalls, but in the meantime, can we just talk about this bag for a second?! This is normally a $450 bag but was a Marshalls find for only $150! It's the perfect tote that's not only a beautiful bag, but large enough to double as a diaper bag from time to time! A mommy must, for sure! Love those pumps. Such a great color! 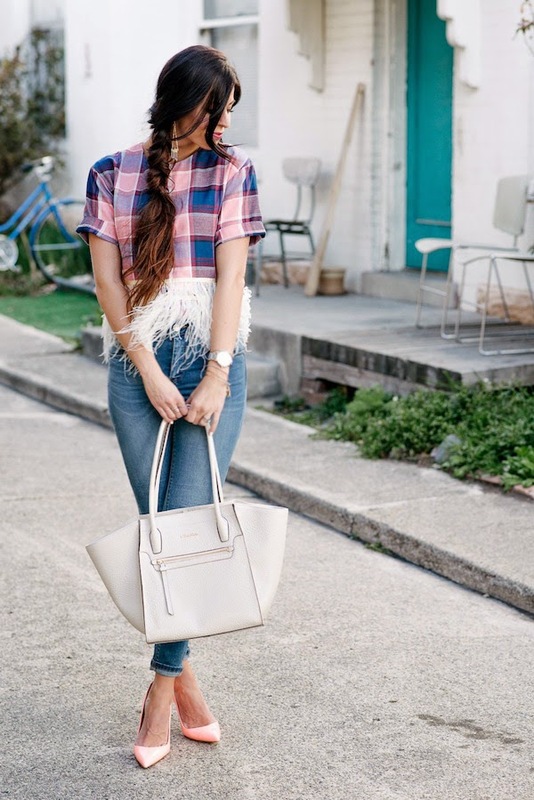 This is one of my favorite outfit posts! The background really puts it all together! In love with those heels!! I am dying a little over this top! It's incredible!! Pretty outfit! Love the feathery top!! I LOVE the corals that are coming out this season! Beautiful shoes! Absolutely stunning outfit , I love it. All match terfectly , you look gorgeous. Thanks for sharing , awsome!! !